In Blackjack Switch, once you are dealt your two hands of two face-up cards each, you have the option to use the switch button to swap the top card in each hand before you play on them. This costs you nothing, and after the cards are swapped, you play the hands as usual. If the dealer hits 22, all bets are pushed. The dealer will always hit on soft 17. Splitting is allowed, but you cannot re-split in this game. Split aces take only one more card before you must stand. If a split ace receives a 10 point card, the player gets 21, not blackjack. If you want to double down it is an option, at a cost of 1x your initial bet. You can double down after a split. Wagers in Blackjack Switch are between 1 and 300 USD/GBP/Euro. All bets are made using a variety of different chips. 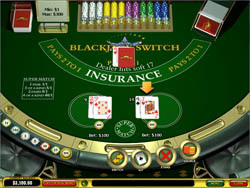 Because you are playing 2 hands, and because the switch option is in place, getting blackjack is more common in this game, so it just pays 1:1. Insurance bets pay 2:1. Blackjack Switch is definitely one of the better looking blackjack games out there. Everything from the table to the cards to the chips are rendered with fine realism, and looking at the scene you’d almost think it were a photograph! The cards and chips are subtly animated, but everything works fast and smooth even on older computers, so there is nothing here to slow things down. The game plays well too, and it seems the designers spent a lot of time thinking about how the game would be played, because it’s basically flawless! When switching, always make a blackjack if you can. The blackjack will automatically push and you will win on that hand 1:1. Also use switch if you can make a hand that you can sSplit, or to make a good hand for doubling down. Split can be a powerful function, and since it costs nothing to use it, it is almost always in your advantage to split your way to a better hand! There are a lot of blackjack variations out there that throw useless new rules and gimmicks at you. Blackjack Switch is not one of those. This game actually works, and besides the switch function, the rules are basically the same as classic Vegas Strip style blackjack. Plus, the game looks great, and the side bet lets you earn more money pretty easily, since it pays even about half the time, so you win more than you lose with it. This is a good game. Period.